Double the size of the can for this big bird and you can smoke a turkey on a beer can. This is a great way to keep the turkey moist by putting steam inside the turkey while it cooks. If you've tried beer can chicken then you know this is going to be one great turkey. Empty the can of beer into a container. Cut the top of the can off and pour in 12 ounces of beer. Add the bay leaves and thyme. Set aside. Make the rub by combining 2 tablespoons brown sugar with the paprika, salt, and pepper. Make the turkey baste. In a separate bowl, combine 2 tablespoons brown sugar, ketchup, vinegar, 2 tablespoons beer, hot sauce, and cayenne. Prepare smoker for a 6-hour smoke. Rub surface of the turkey with the spice rub. Try to get as much as you can under the skin, particularly over the breast meat. 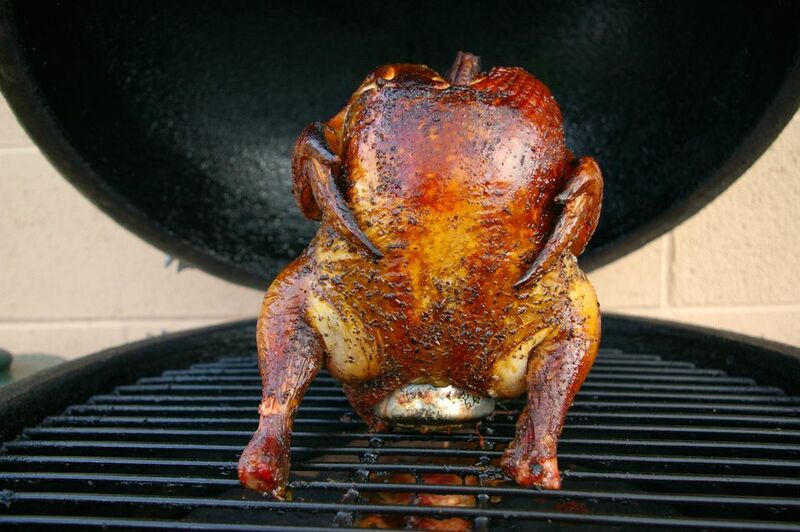 Stand beer can up on the smoker grate and gently set the turkey over the can so that the can is completely inside the cavity of the turkey. Make sure that the turkey stands easily and doesn't sway. The turkey needs to be stable. Once you have the turkey in the smoker, let it cook for about 6 hours at a temperature around 250 F. Baste the turkey with the baste mixture every 2 hours during ​the cooking process. Check for an internal temperature in the thigh of about 165 F/74 C. This is when the bird is done. When cooked, remove from heat and let sit for a few minutes before carving.